San Diego, July 5, 2017 – University of St. Augustine Health Sciences (USAHS) faculty, staff and students cheered on Barley, the USAHS facility dog, and handler Erin Schwier, OTD, USAHS Master of Occupational Therapy Program Director, at a recent San Diego Padres game. 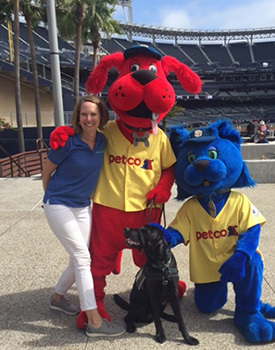 Dr. Schwier and Barley took the field as part of the Petco Park Dog Days of Summer game. Barley is more than just the unofficial mascot for the USAHS San Marcos campus. As a certified facility dog, Barley trained and skilled in enhancing the quality of life and education for children or adults with disabilities or special needs, and seniors. Facility dogs like Barley are handled by professionals, like Dr. Schwier, and can be used to assist a select group of clients better manage their daily tasks. In addition to Barley’s work in the local community as a therapeutic tool at a local nonpublic school for adolescents with learning disabilities, he is a regular in the university’s classrooms and library. Barley provides Dr. Schwier with a unique and innovative way to demonstrate how facility dogs can be used in Occupational Therapy. When he is not helping with demonstrations, clinics and education, he provides students with emotional support and a fun break from studying. Follow Barley and his adventures at USAHS on Instagram at @usaBarley or @uofstaug. For more information on USAHS, visit usa.edu. The University of St. Augustine for Health Sciences (USAHS) is a graduate institution that offers degree programs in physical therapy, occupational therapy, nursing, education and health science, as well as continuing education programs. Founded in 1979, USAHS has locations in San Marcos, California; St. Augustine, Florida; Austin, Texas; and Miami, Florida. USAHS is regionally accredited by the Western Association of Schools and Colleges Senior College and University Commission. USAHS is one of more than 70 institutions in 25 countries that comprise the Laureate International Universities network. For more information about USAHS visit www.usa.edu.